If you want to know the secrets of healthier eating, think of the kitchen fruit bowl. A fruit bowl makes fruit more convenient, attractive, and normal to eat than if the same fruit were in the bottom of the refrigerator. A new Cornell study analyzed 112 studies that collected information about healthy eating behaviors and found that most healthy eaters did so because a restaurant, grocery store, school cafeteria, or spouse made foods like fruits and vegetables visible and easy to reach (convenient), enticingly displayed (attractive), and appear like an obvious choice (normal). 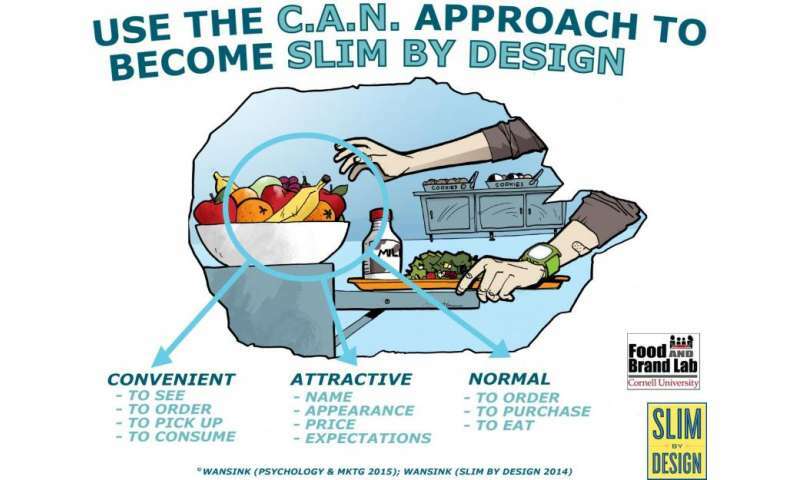 "A healthy diet can be as easy as making the healthiest choice the most convenient, attractive, and normal," said Brian Wansink, Ph.D. author of Slim by Design and Director of the Cornell Food and Brand Lab. 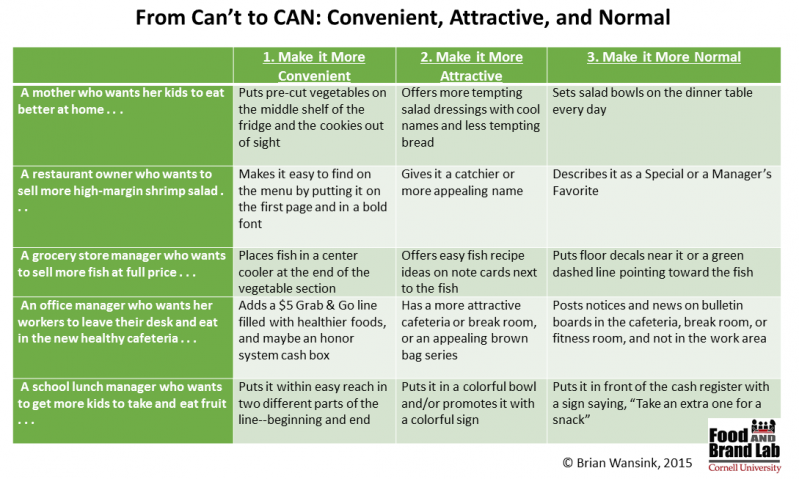 The study, published in Psychology and Marketing, shows that when fruit is put in a nice bowl next to your car keys—or when a cafeteria puts it next to a well-lit cash register—it becomes more convenient, attractive, and normal to grab a banana than the chocolate chip cookie dough ice cream in the far back of the freezer. When restaurants give the high-profit shrimp salad appetizer an enticing name, highlight it on the menu, and have the waitress point it out as a special, it becomes more convenient, attractive, and normal to order that than the deep-fried onion rings on the back of the menu. "With these three principles, there are endless changes that can be made to lead people—including ourselves—to eat healthier," said Wansink. For instance, if a school wants children to drink more white milk than chocolate milk, they can make white milk more convenient (put it in the front of the cooler), more attractive (sell it in a shapely bottle), or more normal (give it half of the cooler space instead of a small corner of the cooler). In previous studies conducted by Dr. Wansink each of these changes increased white milk consumption by 30-60% in schools.